Our 30 years of experience has seen us become the leaders in new home designs, innovation, industry leading guarantees and now we’ve got one more item to add to the list. Introducing our QuickTrak program. If you have titled land, meet our Fixed Site cost criteria and you're one of the first 30 to qualify, then we'll start building your dream home in just 14 weeks*. That’s right, we’re giving you the certainty you desire and it’s just another way that we’ll look after you throughout your entire building journey. Course of events to be completed prior to commencement of construction. *Only available to Henley Fixed Site Cost customers. Fixed Site Cost criteria must be less than 1 metre of fall over the building platform and your land must be in an Estate that we offer Fixed Site costs in. Bushfire to be no more than 12.5 BAL. Homes must not require Town Planning Approval or demolition. Speak to your New Home Consultant for more information. Tender and Contracts will be presented and signed on the same day. Finance must be approved within 30 days of signing HIA Building Contract. Changes to documentation after date of deposit will cause removal from the QuickTrak program. The 14 weeks obligations is based on finance being approved within 30 calendar days of signing HIA building contract, Developer Approval being received within 21 calendar days from application and assumes no dispensation is required. We strongly recommend the use of Waterstone Financial Services. Extensions to these timeframes will affect the overall processing time. Trees on your property and neighbouring properties may have an effect on qualification for QuickTrak. Assessment of your specific site conditions may affect the qualification to QuickTrak. Non-standard variations are not permitted. Should Henley delay the approval to commence your new home in or within 14 weeks, the contracted building period will be reduced accordingly. Any delays associated with the above critical milestones will mean the 14 weeks will be extended by the delay period. Please note that as per the HIA building contract, commencement of construction is the day on which the Building Works commence on the Building Site. 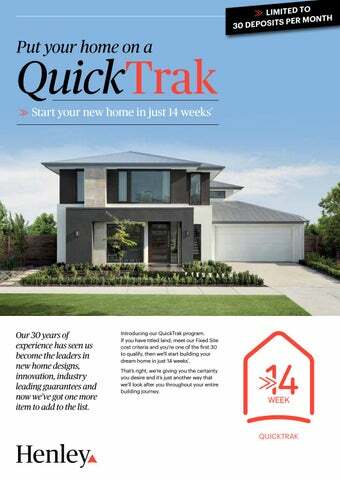 The QuickTrak program is effective from 10/04/19 and this offer is limited to the first 30 deposits every month. 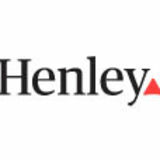 Henley reserves the right to amend or withdraw this offer at any time. Henley Arch Pty Ltd Reg No: CDB-U 49972.